Google Shopping ads have continued to grow and grow over the past few years. Nowadays, if you are running an Ecommerce Adwords campaign and you don't have Shopping set up, you are missing out on some serious potential volume! Here at Big Flare, among our Ecommerce clients we're usually seeing around 50% or more of an Adwords account's total profit coming from Shopping. Google have recognised the importance of Shopping for Ecommerce and have furnished us with new tools and options. Staying up to date with all the latest techniques to use within Shopping is hard and that's why this article is going to tell you exactly what's working with Google Shopping right now in 2018. SPAG stands for Single Product Ad Groups. Instead of grouping lots of products together in the same product group and ad group, segment it out so that every product in your feed has its very own ad group. This will allow you to view product data at the ad group level which is super handy for making decisions more quickly, and it is also essential to performing the below tip about traffic sculpting. You can make the process of creating SPAGs much faster using handy tools like PPC Samurai or Optmyzr. Once you have segmented your products into SPAGs, you now have the ability to use negative keywords to "sculpt" your traffic. Imagine you have a situation where for a given keyword, you might have 3 different products showing up. Let's say only one of those product is a highly profitable seller. In this case you need to be able to control which product shows up for that keyword. And this is where negative keyword sculpting comes in to play. By adding a negative keyword to the other 2 ad groups for the products you don't want to show, you can ensure that when someone searches for that keyword only your top-selling product will show. The general idea is that you set up your broadest campaign (in the above example, "Generic") with a high campaign priority and low bids. Then you add as negative keywords all the terms you want to show in your more specific campaigns. For example, adding your brand terms and then creating a lower priority campaign with higher bids and no negative keywords will ensure that your brand terms show up in the Brand campaign, not the broader Generic one. Oh Google, how you treat us! Google have given us an exciting new toy to play with in the form of Showcase Shopping Ads. These ads are supposed to be used for broader search terms where the user is looking to peruse a range of different options (think "summer dresses" or "home decorations" etc). The ads give the option for you to show the user multiple options from your product line, which is sure to increase your CTRs over standard single-product Shopping ads. When they click, they will see an expanded ad that shows your range of products in that category, plus pricing and review stars. These days, an online customer journey is no longer as simple as: want product > search product > click ad > buy. In fact, it probably never was that simple, we just didn't have the tools to accurately measure a real customer journey until more recently. Customer journeys can be convoluted and long. They may have many different touch-points such as PPC, SEO, Email, Social Ads and these may be spread out over a number of days or weeks prior to the final purchase. Traditional analytics and conversion tracking systems will only record and award the last click before the sale. So, if someone clicked a Facebook Ad, then an SEO listing, then an Email, then a PPC ad, then made a purchase, traditional tracking systems would award 100% of that sale to the PPC ad, because it was the last click. This is called "last click" attribution and it systematically underweights ads that show at the start of the customer journey. This is bad news if you are trying to scale your business, it means you are not giving credit to the ads that actually made the customer aware of your brand and start their purchase journey in the first place. You can improve upon this situation by selecting a different attribution setting in Adwords. For example, selecting "first click" will attribute 100% of the sale to the first ad that was clicked, whereas selecting something like "position based" will attribute most of the sale to the first and last clicks, with a smaller portion of the sale being attributed to every other ad click that was in between the first and last ones. In the above screenshot you can see a comparison of "last click" vs "first click" attribution in one of our accounts. On the far right we see the percentage difference between the two. For example, the campaign highlighted in pink would have been awarded +193% more revenue if we were to switch to "first click" instead of last. And the one highlighted in yellow would have had -56% less revenue if we made the same switch. This shows the massive differences you can affect by changing your attribution setting. So, it really pays to know which attribution setting is ideal for you and your goals. I like to use "position based" attribution in most of our accounts, as this upweights the first click (which is what drove discovery in the first place) and the last click (which is what drove the final sale) but also gives some credit to the middle clicks. You can change your attribution settings under Tools > Conversions. Edit your conversion's settings and choose the attribution method that is best for you. Be sure to separate out your Local Inventory Ads (LIAs) into a separate campaign from your online Shopping ads, as you won't be able to accurately track conversions as they will happen offline. Use some of your offline marketing budget to fund your LIA campaigns and keep the reporting, budget and results separate from your online campaigns. Google Merchant Center (GMC) Promotions will allow you to advertise your discounts, promos and offers to shoppers right there in your Google Shopping ad. In a competitive Shopping SERP you can bet that having GMC Promotions enabled will help you stand out from the competition, as this feature, despite having been around for quite a while, is still seriously under-used by most Ecommerce sellers. We enable GMC for every one of our clients that is willing, and a lot of the time in the SERPs we notice our client being the only result there that actually shows a GMC Promotion! To enable GMC Promotions you'll need to head over to Merchant Center. Under the settings, find Merchant Center Programs. From here you can apply to be in the program (you need to fill out an interest form and wait for Google to accept you. Chasing up your account rep, if you have one, about this can help speed up the process) and learn more about how to set it up once accepted. When you add up all the possible products in your feed, plus all the possible signals you could use to help decide the best bid, then you multiply this by the frequency at which it's ideal to update your bids, you get... A LOT of bid decisions to make (if you are being optimal). But, don't worry! It's 2018 (at time of writing) and we are living in an age that is getting increasingly better AI. And this AI research is here to benefit your Shopping campaigns. 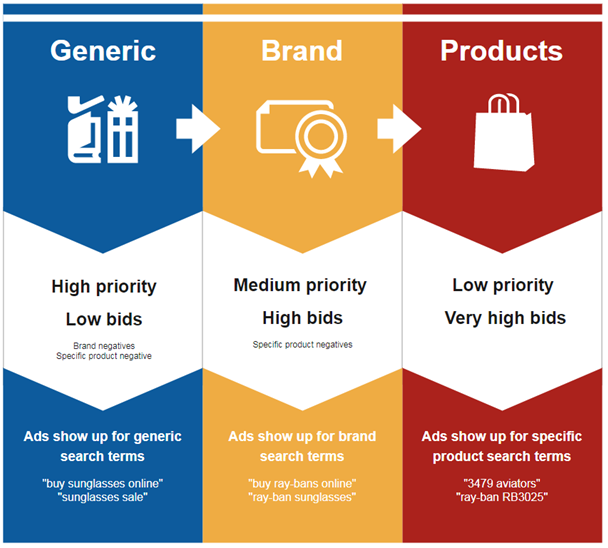 Google's AI-based automatic bid optimisation (AKA Smart Bidding) algorithm is their latest iteration of conversion-based bid automation. It works really well, and simultaneously saves you a tonne of time. With Google's new Smart Bidding you can now plug in your performance goal, for example using a Target ROAS of, say, 300%, and then you can let the machine go away and find the optimal bids for you while you concentrate on more creative things that can't be done better by a machine. To implement Target ROAS Smart Bidding, log in to your Adwords account and head over to the Shared Library and find your Portfolio Bid Strategies. Create a new Portfolio Bid Strategy and select Target ROAS. Put in a target ROAS that makes sense for your business, starting around 300% is often a good place to begin. Group all your campaigns into one large portfolio so Google can use conversion data across campaigns to improve total performance. Make sure you have enough conversions, ideally you want more than 50 per month in your portfolio. The more the merrier though, the more conversions you have the faster the Smart Bidding algo will kick in. Finally, remember that Smart Bidding takes a while to learn. Do not freak out if it doesn't perform within the first few days or even weeks. Really, when using Smart Bidding, you MUST shift to a "30 day" mindset. Allow the algo to have 30 days to optimise and tweak from there if necessary. I wrote about this more extensively in my post about optimising your Google Shopping prices. To summarise: if your prices are higher than your competitions' you could be losing out on significant amounts of traffic in Google Shopping. Google Shopping is very sensitive to prices, and usually the product with the lowest price gets the 1st position and most traffic. Research has shown that even a 5% increase in price can cause a 60% decrease in Shopping traffic. So getting your pricing right is super important. Experiment with your pricing and see what works best for you. If you took a 5% hit on your margins, would that be ok if you got 60% more Shopping traffic? Run the tests and figure it out. You might be surprised at how much more Shopping traffic you could be getting. It's no secret that when deciding what keywords to show your Shopping ads for, the first place that Google looks is your Product Titles in your data feed. You need to make sure that your Product Titles have a good, logical structure to them and that the most important keywords are right there in the title. In terms of importance, Product Titles have a much higher weighting than any other field. Even the keywords in your descriptions have a negligible impact on performance. The one area where the keywords in your feed make a big impact is in your titles, so get them right! Try experimenting with keyword ideas in your titles too. Google is pretty good these days at understanding the meaning behind words and then showing your ad on synonyms and related words. So, if you are selling "soccer boots" in the UK and someone types in to Google "football boots", Google is most probably going to know those are the same thing and will show your ad. However, Google doesn't understand everything yet, and if you look at the search query reports for your Search campaign and compare them to the search query reports for your Shopping campaign, you may discover some differences. If there are any high converting terms in your Search campaign that are NOT showing in your Shopping campaign, it may be time to test adding those terms into your Product Titles. You can get a lot more fancy with this. I like to also connect Google Analytics and pull in engagement-based audiences, such as "Time on site > 2mins" and "Visited >= 3x". But as a starter set for your first foray into RLSA for Shopping the above should do just fine. If keywords in your Shopping campaign are converting, it stands to reason they could also work in Search, right? For Ecommerce search results, Google often shows Shopping ads these days but not always. For those times Google decided to only show Search ads, you are going to miss out on a slice of the pie if you never set up Search ads for that keyword. Furthermore, even when Google does show Shopping ads, some proportion of users are still going to click the plain old text ads underneath for one reason or another. Maybe the copy spoke to them, maybe the offer was clearer in text. If you don't have Search ads set up for all your converting terms from the Shopping campaign, you are going to miss out on those potential sales. And there you have it! Our list of 12 advanced-level Google Shopping tips. If you are struggling to get to the next level in your Google Shopping campaign then give these a go. By the time you work down the full list your campaign should be in much better health that it was at the start. Older PostFacebook Ads vs Adwords: Which One Is Better For Growing Your Ecommerce Store?